A colloid may be a mixture of one substance that may spread out evenly inside another substance. They may be in two different phases or states of matter. One substance can be the dispersion medium, such as water or gas. The other is kind of dispersed medium, sometimes called the 'internal phase'. This is never tiny solid particles. Otherwise, if the dispersion medium is a gas, then the internal phase may be either tiny particles or tiny droplets of a liquid. Definition: A colloid is a substance microscopically dispersed evenly throughout another substance. The dispersed-phase particles have a diameter between about 5 and 200 nanometers. Milk is an emulsion, which is a colloid in which both parties are liquids. Shaving cream and whipped cream are colloids of gas inside a liquid. Gels, such as agar, jelly or even opals, are colloids of liquids inside solids. Styrofoam and pumice are gases inside solids. 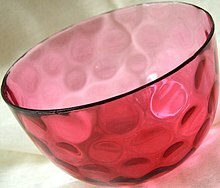 The red colour of cranberry glass is caused by the reflection of light off gold particles in the glass. The glass is a colloid of solid particles inside the solid glass. Mud is usually considered a suspension because the dirt will settle, but it may be a partial colloid, particularly with very fine-grained clay. Fog is a complex mixture in which air has both water droplets and solid particles. It may be colloidal in parts. ↑ "Colloid". Britannica Online Encyclopedia. Retrieved 2009-08-31. ↑ With a natural substance, it may be only partly colloidal. This page was last changed on 25 March 2019, at 06:45.